General Discussion / Re: huh? "Assertion failed on expression: '!go.TestHideFlag(Object::kNotEditable)'"
I did managed to eventually fix/remove remaining errors. I've found couple missing scripts on my player character and when I removed those scripts and removed references from Playmaker to those missing scripts. !go.TestHideFlag errors disappeared. 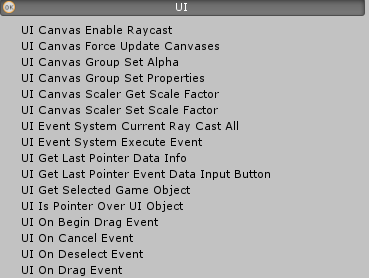 I guess I'll try deleting game objects from copy scene to try to track it down. It would be great to explain the context of which this happens, do you edit a prefab, do you have other assets, what are the few things you did before it started popping up? So it's a huge project. That I've recently moved from Unity 5.6.6 to Unity 2018.3. I've also upgraded Playmaker. I see those errors when I make a build of the game. I previously mentioned how I was able to reduce number of those errors significantly. But something still generates 3 of those errors. 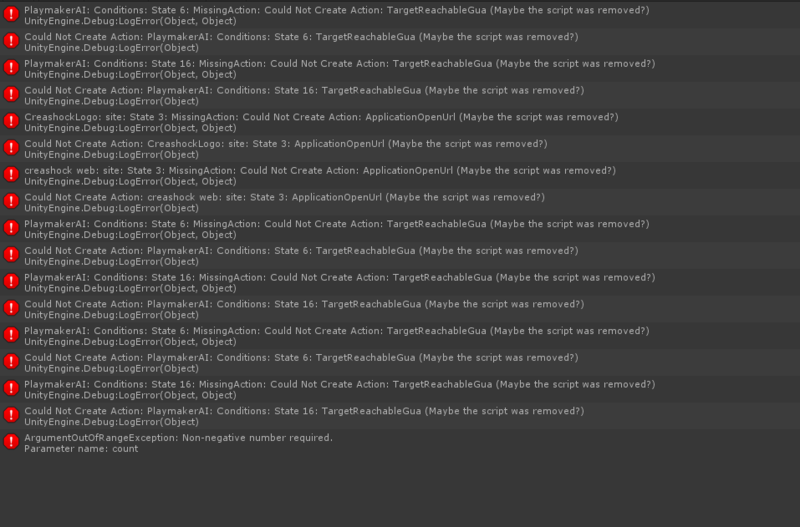 Currently I can tell that those errors start to pop-up when I add Bellville_bbb_ccc.scene and hit build button. I've made big progress on solving this issue. I had costume action called Play Random Sound Gua and it seems that disabled uses of this action were not properly upgraded. So I've found all those problematic instances of this action use and removed them from prefabs. This removed almost all of those errors. 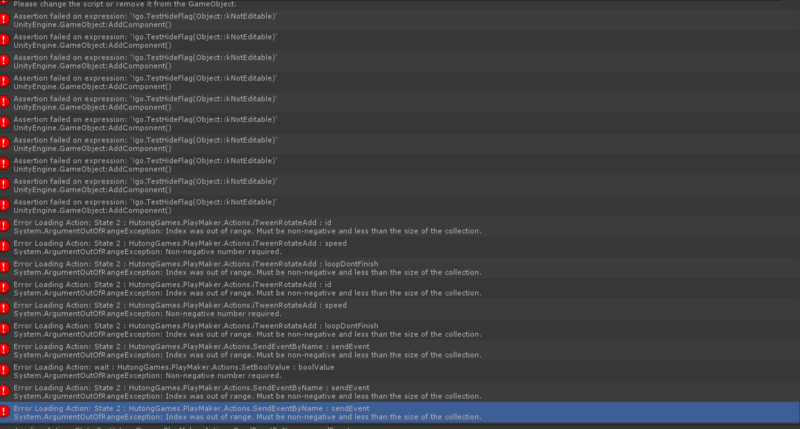 I think to remove few of those errors that remain, I need to solve those iTween actions issues. 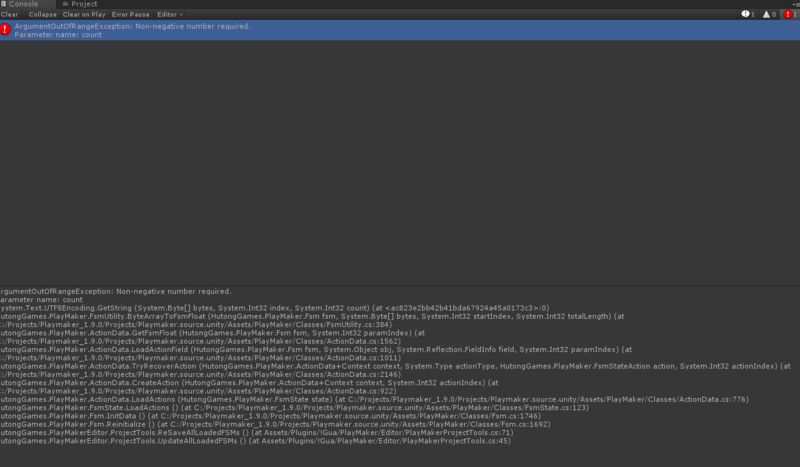 Got same errors, when making a build of the game on 2018.3 and Playmaker 1.9. Have no idea how to solve it.